Multinational enigmatic art rockers The Red Paintings have announce the release of a very special vinyl edition of their critically acclaimed debut album ‘The Revolution Is Never Coming’. Limited to just 500 copies worldwide, the 23rd of October will see the release of a two disc coloured vinyl edition of ‘The Revolution Is Never Coming’. One disc will be white while the second will be red. The vinyl edition will be available to pre-order from The Red Paintings online store at http://www.theredpaintings.com/trinc/music-store. Audiophiles will also be able to acquire the vinyl directly from the band on The Red Paintings upcoming tour – if there are any left! ‘The Revolution Is Never Coming’ was 5 years in the making and features a 35-piece orchestra, 22-piece choir and more across 13 tracks of biting, futuristic alternative rock. The album was recorded and mixed with the late Bryan Carlstrom (Alice in Chains, Rob Zombie) in world-class studios around the globe. Typically ahead of the game, The Red Paintings raised donations from their fans to fulfil their creative vision long before the likes of PledgeMusic and IndieGoGo became household names. Part of a live experience with The Red Paintings is a focus on the visual aspect of the performance, with every tour featuring a different set design and unique costumes among the distinctive elements. Local artists are invited to submit their works to The Red Paintings who will invite certain artists to the shows to paint their works on human canvasses, who are volunteer models who offer to be painted as part of the show. The Red Paintings frontman and creative director Trash McSweeney has a sublime vision that a show should be as visually stimulating as well as just a musical experience. Now it is over to YOU! The Red Paintings are seeking both artists and human canvasses to get involved with their tour next month, so if you are an artist (hobbyist or professional), The Red Paintings want to hear from you. If you wish to volunteer yourself as a human canvas and be part of a once in a lifetime experience, The Red Paintings want to hear from you. To register your interest in joining The Red Paintings on stage as either painter or human canvas, contact them at artsubmissions@theredpaintings.com. Following a Summer and early Autumn of touring the world, including Australia, New Zealand, the US and across Mainland Europe, The Red Paintings will return to the UK for a ten date headline tour in November. 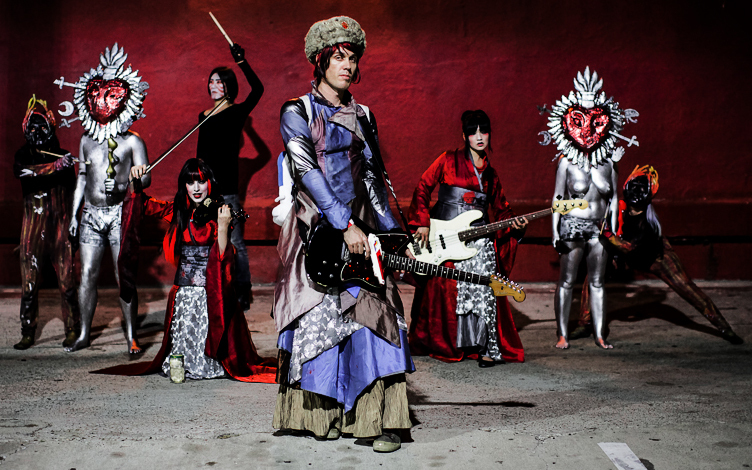 With the show including unique set designs, one of a kind costumes and live participation from local artists and volunteer human canvases, The Red Paintings live experience is like no other band on the planet, and simply must be seen. Support on all dates will come from ‘Them & Us’. Tickets for the tour are on sale now. The Red Paintings November 2015 UK Tour is presented by X-ray Touring. All shows are 14+.